The Ahmanson Theatre in the Los Angeles Music Center is a big house, usually home to touring musicals like the upcoming Dear Evan Hansen and Come From Away. About once a year they book a touring play which usually proves too small for the cavernous space. 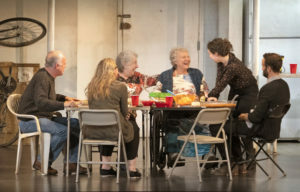 That was not the case in the 1970s and 1980s when the theatre produced its own yearly program of plays from Cyrano de Bergerac and On Golden Pond to Macbeth and The West Side Waltz with big stars like Richard Chamberlain, Julie Harris, Charlton Heston, Vanessa Redgrave and Katharine Hepburn. The house seemed more intimate then, a great place for the spoken word. Now when a non-musical takes the stage, the sound is often swallowed up by the daunting space. 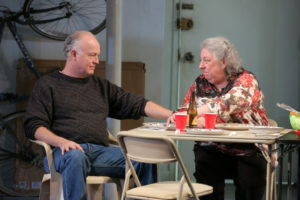 That is the case with the current offering, the Tony-Award winning The Humans by Stephen Karam. Often it’s a cut down version of the play that is offered on tour but not this time. 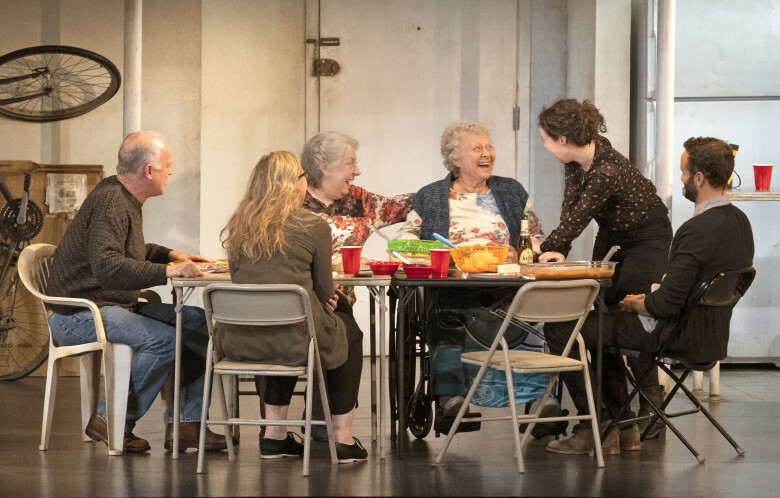 Director Joe Mantello has gathered his Broadway cast, including its two Tony Award winners, for the Los Angeles run and the two-level set by David Zinn is intact. It’s that nothing much transpires in the intermission-less 90 minutes. This would seem to be Karam’s attempt at August, Osage County or even Long Day’s Journey Into Night introducing yet another dysfunctional family. In that case, this is his Long Day’s Thanksgiving Dinner in a Chinatown Duplex. The Blakes of Scranton, PA have gathered for the holiday at the new apartment of their youngest daughter Brigid (Sarah Steele) and her boyfriend Richard (Nick Mills). 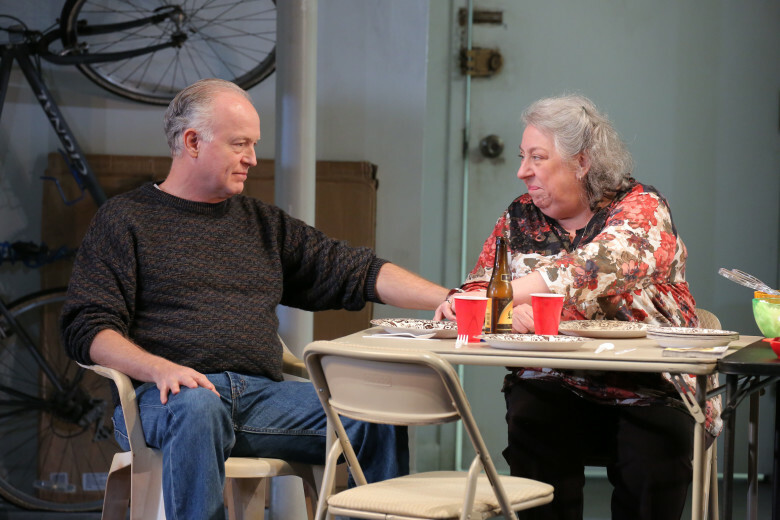 There seems to be some tension in the air between long-time married Erik (Reed Birney) and Deidre (Jayne Houdyshell). They have brought Momo (Lauren Klein), Deidre’s mother who has dementia and is subject to fits when she’s not passed out from the drugs she is on. Older daughter Aimee (Cassie Beck), a Philadelphia lawyer, has joined them. The Blakes are proudly Irish Catholic as they demonstrate with their strange toasts and housewarming gifts (a statue of the BVM). Secrets are revealed—Aimee is about to be fired, Erik cheated on Deidre and was fired from his job of 28 years. Aimee is still obsessing over the breakup with her longtime girlfriend. Everyone seems to be having money problems—Erik lost his pension, the Blakes can’t afford a caregiver for Momo, Aimee needs surgery for her ulcerative colitis, Brigid would like to compose music but student debt keeps her working as a bartender. Rich is getting by until he comes into an inheritance in 2 years. They are ordinary everyday problems that the writer seeks to heighten with his mysterious foreshadowing. The flooding of Manhattan’s Chinatown from Hurricane Sandy and 9/11 are thrown into the mix. There is the near constant thunderous sound (design by Fitz Patton) from the upstairs apartment of a 70-year old Chinese woman who must be running a bowling alley from the noises heard. There are the constant light failures (great backlighting effects by Justin Townsend) that give a ghostly feel to the production. 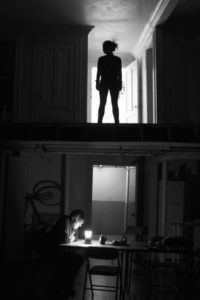 At times Mantello’s direction promises to take the play in an eerie (and more interesting) direction but never follows through. The cast is fine but you just wish they had a better script to work from.